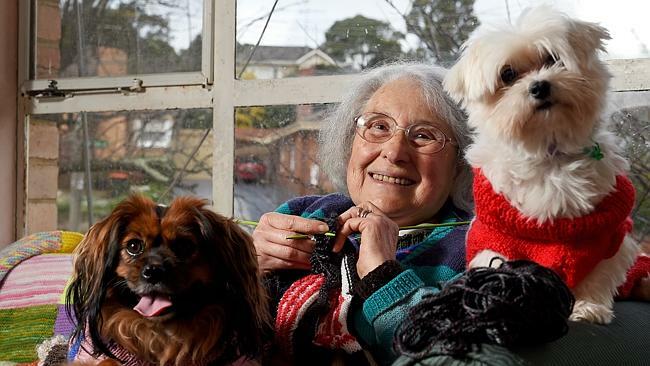 Through countless purls and stitches Josephine Erlich – grandmother and nominee of the Herald Sun Community Spirit Medal Award – has created hundreds of knits that have kept lost, abandoned and neglected animals warm during the coldest of days. With her knitting needles weaved through her fingers and a basket filled with balls of yarn resting at her feet, since 2005 the 75-year-old avid knitter has posted parcels filled with knitted jumpers and blankets to The Lost Dogs’ Home on a monthly basis. Josephine has a selfless love for animals and is just happy knowing her knits have gone beyond her craft basket, to be wrapped around deserving animals, even though she will never meet them. For Josephine, the clinking of the plastic and metal needles and the repetitive motions of purling and weaving helps her to unwind and let herself drift off into quiet contemplation that comes with the hobby. With her love for knitting beginning when her grandmother first taught her how to cast on, Josephine is keen on imparting the best thing she has learned from knitting with the new generation of emerging knitting enthusiasts. Sage advice, she conceded can be applied to all areas of life, and not just the craft she has come to love dearly. Listen to our interview with Josephine on Pets-A-Loud. Fancy knitting for our shelter animals? The Lost Dogs’ Home has a valued close-knit community of knitters. You too can join them by downloading our knitting patterns below and dropping off or posting your creations to 2 Gracie Street, North Melbourne 3051.